Road rage can be a serious problem. At the very least, it will make you and those around you unhappy, but at worst, it can actually cause dangerous–and sometimes fatal–situations. So if you find yourself succumbing to road rage while driving, here are some tips to help let go of the tension. Sometimes all it takes is some cold, hard facts to persuade someone that they need to change their ways. And if you are looking for evidence that road rage is dangerous, look no further than this infographic, which shows just how many murders and other problems are created by road rage. Music can have a great effect on our emotions. While the wrong kind of music can get you more excited, emotional, or angry, listening to soothing music can be the perfect thing to stop yourself from getting hot under the collar. 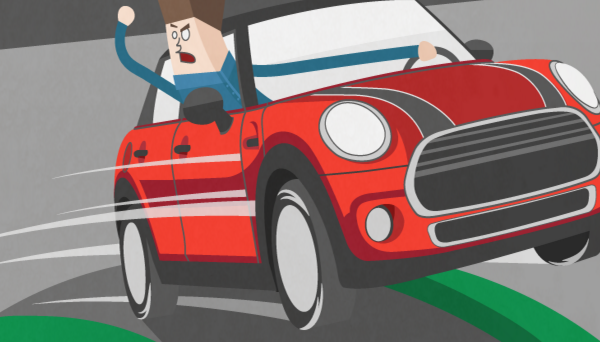 If you are running late, you are far more likely to get yourself into road rage incidents. Try to organize your schedule, and leave a little bit earlier so that you are not rushing to get places. It might seem like a strange suggestion, but most people are more likely to remain calm if they have others in the car with them, especially if those people are coworkers or other acquaintances that you would rather not see you in such a condition. Many people get grouchy when they are tired, so make sure that you get your full eight hours (or whatever it takes!) each night. The same goes for being well fed. If you plan your route out carefully, and check traffic before you leave, you will be better at avoiding those rage-inducing traffic jams. If there are certain intersections or roads that tend to incite anger, try to avoid them where possible. You never know what someone else is going through. Before winding your window down to scream at the person that just cut you off, take a second to consider that they might be having the worst day of their life, or maybe they just made a simple mistake and feel horrible, either way, is it worth chewing them out over? Often that rage starts boiling up and it can seriously affect the way that you are driving. When this happens, it is no better than buzzed or drowsy driving. Take a minute to pull over, take a break, and calm yourself before driving again. If someone does something seriously dangerous on the road, or you start having an altercation with another road rager, it is always better to call the police rather than try to address it yourself. At the end of the day, if you avoided an accident, what does it matter what the other person did? And if you got in a fender bender, what is going to be helped by getting angry about it? Sometimes all it takes is to take a step back, take a deep breath, and realize that it is not the end of the world. It will make for a much happier journey!